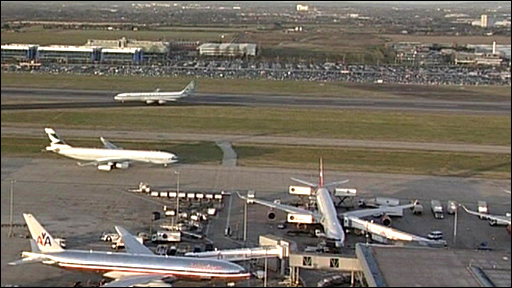 Transport Secretary Geoff Hoon has announced government approval for a third runway at London's Heathrow Airport. Here is an examination of the issue. The plan is for a new 7,200ft runway, allowing the annual number of take-offs and landings to increase to 605,000 by 2020 and 720,000 by 2030 - up from 480,000 today. A new terminal, capable of handling 35 million passengers per year, would serve long and short-haul services. A new tunnel would allow the A4 to pass under taxiways between the airport and the new runway. The M4 spur to the airport would also have to be moved and hard shoulders on the most congested motorways would be opened up to be used during peak times. Will it fit on the existing airport site? No, it would be built north of the airport. The development would result in the loss of around 700 homes, including the entire community of Sipson and Heathrow Primary School. Will there be a new rail link? There is no firm commitment but the government says it is setting up a company to look into new high-speed rail services between London and Scotland - with a new line between London and the West Midlands. Transport Secretary Geoff Hoon says there is a "strong case" for the new line to get to London "via a Heathrow International hub station on the Great Western line, to provide a direct four way interchange between the airport, the new north-south line, existing Great Western rail services and Crossrail into the heart of London". Is 'mixed mode' use of runways being brought in? This has been rejected by Mr Hoon. It had been proposed that, as an interim measure to allow extra flights before the runway is built, the existing two runways be used for both take-offs and landings - known as "mixed mode". Currently the "alternation" method sees planes landing at one runway until 3pm and then on the other one for the rest of the day to give residents near each runway half a day's break from noise. But there is to be an end to the Cranford agreement which restricts planes taking off over Cranford, to the east of the runway. Cranford would get more flights, while parts of Feltham and Windsor would get fewer. Mr Hoon said this would "extend the benefits of runway alternation" to those affected by aircraft noise when the wind blows east. Who is for the third runway? The government has said it supports expansion in principle, subject to it meeting the EU targets. Airport operator BAA and British Airways say a third runway is "critical", particularly given the tough economic climate and many unions back it. Many businesses also support expansion - the Confederation of British Industry says the UK needs direct access to "economic powerhouses" like China and India. Many environmental groups and residents who live around the airport are strongly opposed to further expansion due to fears about increased noise and air pollution and congestion. The Conservatives and Liberal Democrats also oppose the third runway and the government faces a backbench rebellion, last year 40 Labour MPs backed calls to put it to a Commons vote - they said the government relied too much on data from Heathrow owner BAA in assessing the case for expansion. The Conservative mayor of London, Boris Johnson, also opposes it. Why does industry want it? The Future Heathrow pro-expansion group, made up of businesses, trade unions and aviation firms, says a third runway is vital for trade and tourism, and to secure the future of an airport employing 72,000 people. Business groups fear Heathrow is losing ground to rival European airports in Paris, Frankfurt and Amsterdam which will each have four runways by 2012. Green campaigners have been backed by the Environment Agency, which said a new runway would fail EU pollution limits because of unsafe nitrogen dioxide levels. 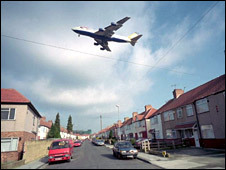 Groups such as the Heathrow Association for the Control of Aircraft Noise (HACAN) and the No Third Runway Action Group have protested against the proposal on the grounds of excessive noise and because it will destroy communities. The 2M group, an alliance of 12 local authorities, claims the economic benefits are overstated and the environmental costs ignored. It says carbon emissions will double by 2050 if the government's assumptions about the development of new, environmentally-friendly aircraft prove incorrect. How can environmental targets be met? The government says there will be an initial cap on extra flights to about half of the original proposal - 120,000 a year, rather than the 220,000 originally envisaged. It also says only the cleanest planes will be allowed to use the new runway. And it says there will be a new aviation emissions target - that levels in 2050 will be lower than those of 2005. It admits that nitrogen dioxide levels at Heathrow are higher than the EU limit - which is supposed to come in in 2010 - but says it is likely to ask for an extension to 2015 and says it could be met mainly by reducing car emissions. Opponents say hundreds of thousands of homes will be exposed to more noise from planned new flight paths. The government had already committed not to enlarge the area in which average noise exceeded 57 decibels - the level considered an irritation. It says this can be done, even with a third runway, because newer aircraft are quieter and will get priority. It insists no extra flights will be allowed until the Civil Aviation Authority is satisfied noise and air quality conditions have been met and will not be breached. The CAA will also have a legal duty to take "action needed to come back into compliance" if limits are breached. MPs will get a chance to grill ministers in a Commons debate and have been pressing for a vote but the government says it is a "long standing tradition that the House does not vote on quasi-judicial planning matters". The airport operator will then have to submit its plans and go to a planning inquiry. This inquiry will be held under new laws designed to speed up the process, but it is still likely to be a long and complex process. The plans are likely to face a legal challenge from environmental campaigners or local authorities, possibly based on a potential breach of EU pollution limits. 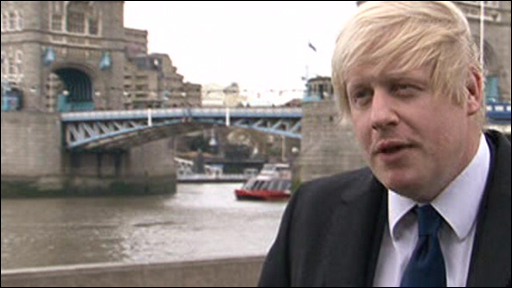 London mayor Boris Johnson says he is "determined to lead a challenge against it". Construction would be likely to start in about 2015 and, it is not expected it to be built until 2019/20. If Labour loses power at the next election it looks like it won't go ahead anyway, as both the Conservatives and Lib Dems oppose the runway and say they would scrap the project. The Conservatives want to scrap the plans and instead back a £15.6bn into a high-speed rail link between London's St Pancras, Birmingham, Manchester and Leeds. They claim it could cut Heathrow flights by 66,000 per year. The Liberal Democrats reject the idea of any airport expansion in south-east England. They also favour high-speed rail links. Mayor of London Boris Johnson has suggested that a 24-hour airport could be created on an artificial island in the Thames Estuary, possibly replacing Heathrow altogether.